The goal of this deck, as always, is to chain a bunch of spells into a lethal Tendrils of Agony. The way you do that is by playing a bunch of artifact mana and using Paradoxical Outcome to rebuy them all. Paradoxical Outcome is particularly powerful because you draw a bunch of cards and get to replay your artifact mana untapped and keep the chain going. While this build has many cards in common with other builds of Paradoxical Storm, the flex slots really show that you’re trying to attack Workshop decks and opposing Blue decks. Mana Drain is a particularly punishing spell against Mishra's Workshop decks, and can frequently allow you to combo off with ease on your following turn. Baral, Chief of Compliance is a creature-based ramp spell that helps you fight through the likes of Thorn of Amethyst and Lodestone Golem. 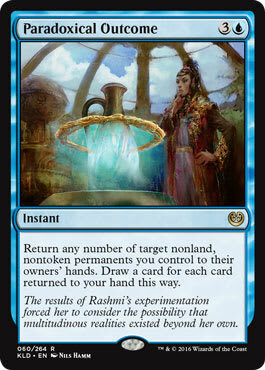 A turn one Baral can easily lead into a turn two Paradoxical Outcome and threaten to end the game on the spot. Monastery Mentor hasn’t typically been seen in these types of lists, but its presence gives you a way of playing a more value-oriented deck with a combo finish if your opponents have too much hate for you to actually storm them out. As for opposing Blue decks, both Thoughtcast and Mystic Remora do a great job of ensuring that you stay up on cards and have the raw resources required to force through your key spells. If you want to play Storm in Vintage, consider giving this variation of Paradoxical Storm a chance. Storm builds featuring Mana Drain and Mystic Remora have been powerful forces in past metagames, and this may be the time for those decks to come back.